Over the next two years, the RSA, in partnership with Power to Change, RIO and Sheffield University Management School, is delivering a leadership programme for community business leaders and will be exploring the unique leadership challenges faced by those leaders. As someone who helped Power to Change draft the tender document and assess the applications to run the programme, RSA Fellow Stephen Clare holds the issue of leadership is very close to my heart and this will be the first in a series of blogs over the length of the programme. So, let’s start at the beginning. What is leadership? Such a simple question, and yet it has generated thousands of books and an industry in its own right. The ideas about leadership in management literature would have us believe that there are leadership traits, that there are leaders who are ‘great’, leaders who enable their people, that have a need for achievement, a certain style, interpersonal skills, and so on. In the many courses on leadership, managers will be told that they need to be trustworthy, charismatic, visionary, and obsessed with goals. They must challenge assumptions, behave as a role model, walk the talk, and empower their people. All perhaps relevant to the old hierarchical, command-and-control organisation of the last century. 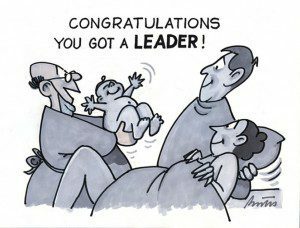 But what do we know about the reality of leadership today? What must leaders believe or know in order to influence others and create change? Leadership has nothing to do with seniority or one’s position in the hierarchy of a company. Often talk about a company’s leadership refers to the most senior executives in the organisation. They are though just that, senior executives. Leadership doesn’t automatically happen when you reach a certain pay grade. Hopefully you find it there, but there are no guarantees. Leadership has nothing to do with titles. As with the point above, just because you have a CEO or Director-level job title doesn’t automatically make you a ‘leader’. You don’t need a title to lead – you can be a leader in your neighbourhood, in your family, within a social environment, all without having a title. Leadership has nothing to do with personal attributes. Say the word ‘leader’ and most people think of a domineering, take-charge charismatic individual – the ‘heroic’ figure. We often think of icons from history like Churchill or Napoleon (who memorably said “A leader is a dealer in hope”) or from business like Richard Branson or Steve Jobs. Today we see a lot of criticism of Jeremy Corbyn precisely because he doesn’t (pretend to) have all the answers. But leadership isn’t an adjective. We don’t need extroverted charismatic traits to practice leadership. And those with charisma don’t automatically lead. What a wonderful outcome that would be for the Community Business Leaders Programme!